oh god... im fangilling like crazy....i just... im trying to restrict myself ... is ... so... hard! 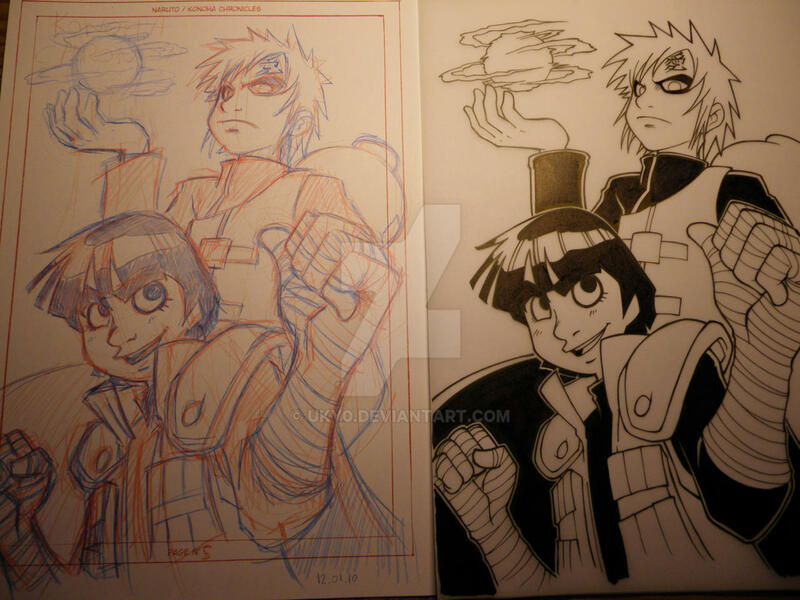 I am amazed love ur gaara and lee!! I don't get it. How do you get rid of all the pencilling so completely? Is your eraser that good? Doesn't the paper tear? Ah, I thought the paper looked strange! It doesn't seem like tracing paper though.. is it animation paper? That's genereally good quality stuff. Thank you for telling me! Feel free to try it too ! it's an "experience"
Sigh. I shoulda known that years ago. I'll try it for the rest of my things. In the meantime, my doujin is just in plain pencil. I guess it's a simple way to have a clean version of your sketches ! Best wishes for your doujinshi ! Ca a été un casting tres orienté ! I will go on releasing some previews of pages here or on facebook as soon as I can complete the rest of the doujinshi. Oh damn that Facebook, I don't have an account there._. ;; I hope you'll upload something here too^_^ How long is your doujinshi going to be, btw? Hehe, no problem, I use to post here a lot, or on my blog [link] I don't want to post too much unfinished works here.